Wednesday afternoon’s Farmers Market in Delaware drew a large crowd long before the bell rang at 3 p.m. signaling the start of sales. 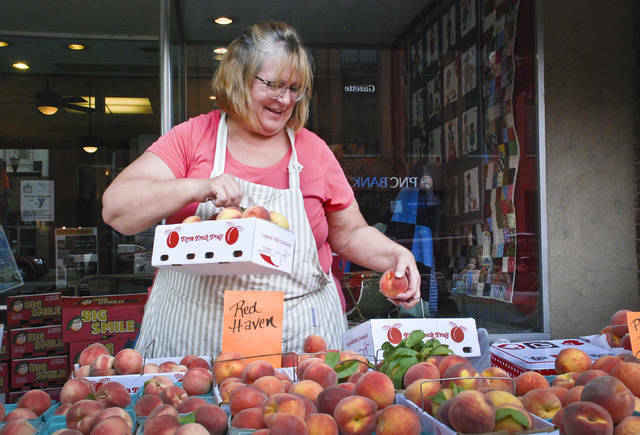 Cheryl the Peach Lady filled a couple of tables with small boxes of fresh peaches from Licking County. After the bell rang, she had several buyers flocking to her table once they saw the fruit. This entry was tagged delaware, Farmers Market, Peaches. Bookmark the permalink.